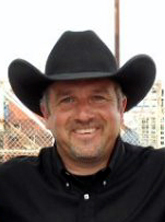 Jeff Medders has been the television voice of rodeo for two decades. His sound is familiar and strong, a great correlation for the sport and its stars. Now as the man in charge of Geronimo Productions, Medders’ schedule gets a little more intense in 2011. You see, in addition to producing every Championship Bull Riding TV broadcast — as Geronimo has done for the last three years — Medders and his crew will put together the shows for the Seminole Hard Rock Xtreme Bulls Tour, 10 Professional Rodeo Cowboys Association’s Wrangler Million Dollar Tour events for In Country Television and four big PRCA events for GAC — the Ram National Circuit Finals Rodeo, the Justin Boots Playoffs (Puyallup, Wash.), the Justin Boots Championship (Omaha, Neb.) and the All-American ProRodeo Finals presented by Pendleton Whisky (Waco, Texas). Working big rodeos is nothing new to Medders, who has served as the play-by-play man for the Wrangler National Finals Rodeo for most of the last 20 years. While Geronimo is a competitor to longtime NFR TV producer Winnercomm, also a Tulsa-based company, Medders has returned to work ProRodeo’s championship because of his professionalism and understanding of rodeo. It’s why he’s a major player for the CBR, and Medders said the relationship with the stand-alone bull riding organization has been important to Geronimo’s success. That says a lot, especially considering what he has done for rodeo.